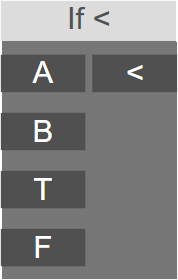 Compares A and B inputs, and outputs T if the value of A is smaller than B. The node compares the A input to the B input. If the value of B is smaller than the value of A, the output equals the value of the T input. If A is higher or equals to B, the output will be the value of the F input. T: True value. If the statement is true, this value will be on the output. F: False value. If the statement is false, this value will be on the output. <: The True / False value of the statement: A<B.